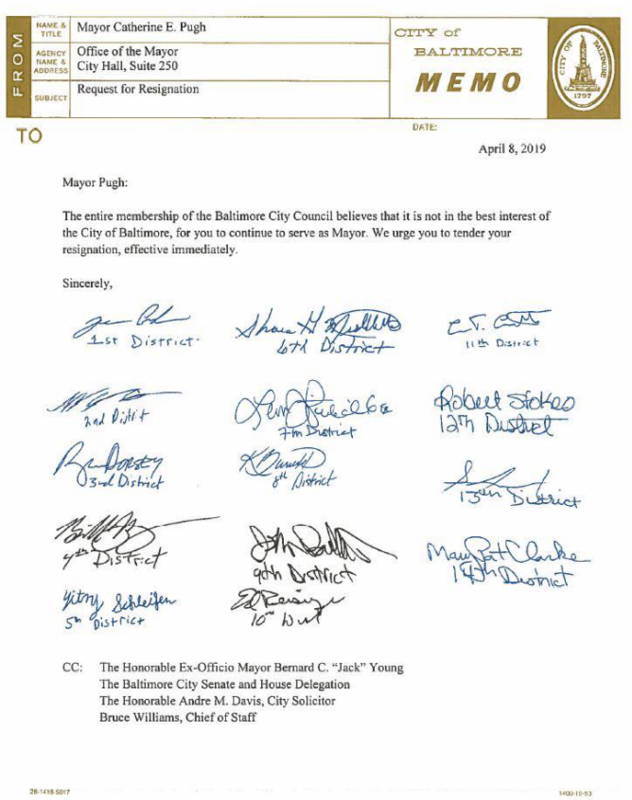 The Baltimore City Council delivered a short, but strongly worded letter to Mayor Catherine Pugh early Monday morning, urging her resignation. In a response just before noon Monday, Pugh vowed to return to office. In an emailed statement from spokesman James Bentley II, her office said the Mayor "fully intends to resume the duties of her office and continuing her work on behalf of the people and the City of Baltimore” once she has fully regained her health following a bout of pneumonia. The call for Pugh’s immediate resignation comes as the first-term mayor remains embroiled in a children’s book scandal that is now under investigation by the state prosecutor. In a story first broken by The Baltimore Sun, Pugh received $500,000 from the University of Maryland Medical Center while she sat on UMMS board for 100,000 copies of her self-published Healthy Holly book series. In addition, The Sun has reported, Pugh received another $300,000 allegedly for copies of her book by companies and organizations with business before the City. Most of the books, the majority of which were said to have been donated to the Baltimore City Public School System, have yet to be located. Currently, Pugh remains on an official leave absence while recovering from pneumonia. City Council President Young has been assuming the official duties of the mayor in her stead. That said, Cohen told Baltimore magazine, with the General Assembly coming to a close Monday there is no time to make a change to the city code and charter this session that would enable the City Council to remove the mayor from office. As the City Council and Baltimore residents learned during the criminal investigation of former Mayor Sheila Dixon, removing even a mayor convicted of a crime might not be legally possible. In 2010, Dixon resigned as part of a corruption plea deal after she pled guilty to perjury and embezzlement. As part of that deal, Dixon got to keep her $83,000 pension. Prior to serving as mayor, Pugh served two terms on the City Council and 10 years in the state senate. The book saga has begun receiving national attention in recent days, including a skewering take from HBO's John Oliver. Washington Post book critic Carlos Lozada recently “reviewed” Pugh’s Healthy Holly: Exercising Is Fun! On Friday, the fundraising consulting arm of Pugh’s 2020 reelection organization, TruBlu Politics, cut ties with the mayor over the ongoing book scandal. “In light of recent events, we decided to end the relationship with Mayor Pugh,” David Goodman, a TruBlu partner told Baltimore. TruBlu, which has worked with a roster of politicians in Maryland and beyond, signed on to Pugh’s election campaign in October 2017. Also on Friday, Jim Smith, a top Pugh advisor and former Baltimore County executive and former judge, who was cited for an illegal loan to Pugh’s 2016 campaign, resigned from his cabinet post as chief of strategic alliances. Another source close to the Pugh campaign and familiar with TruBlu Politics told Baltimore that the mayor has decided to suspend her 2020 re-election bid even as she plans to fill out her current term. No formal announcement has yet been made, however, regarding her reelection effort. According to a January filing with the Maryland State Board of Elections, Pugh’s re-election committee has $968,790 in cash reserves. With more recent fundraising events that have yet to be reported, the number could be above $1 million at the moment. In an off-election year, she will not be required to file another financial report until next year. Campaign chairman Steve Sibel, a partner with Caves Valley Partners, a Baltimore real estate development company, would not comment when reached Friday and asked if the Pugh had decided to suspend her 2020 campaign. If Pugh does decide not to run for re-election, she will have several options regarding the money in her campaign coffers. She can return funds to donors. She can also donate the funds to charity, as the widow and sons of former Baltimore County Executive Kevin Kamenetz did after he died unexpectedly during his bid for governor. Pugh may also reimburse herself for any personal loans she gave her campaign. She may also pass funds to other politicians, although who would accept that kind of financial gift from the mayor while she remains under investigation isn’t clear.